Banana is one the best natural foods for man. It is sometimes called all in one food as it contains various types of vitamins and nutrition in it. It is available in any place around the world. Apart from its taste, banana has some benefits for both for adults and kids. It is helpful for preventing diarrhea, constipation, reducing skin inflammation and friendly to stomach. And you can get all these benefits with in a very cheap price as banana costs very low. As a baby food, banana is the perfect because it is soft, tasty, easily blends with other food items and most importantly contains the nutrients essential for your baby. Here we show, 5 easy homemade banana baby food recipes for your children. Banana is an ideal baby food for its different qualities. First of all, the vitamins and nutrition. It has Vitamin B2 and B6 and Vitamin C. It also contains potassium and fiber too. It is easy digestive and good for baby’s stomach. It prevents constipation and controls Diarrhea. As some babies suffer from Allergy problem, Banana is the best for them because it is less Allergic food. Moreover, Banana peel gives relief to any kind of inflammation caused by insect bite to baby’s skin. To slice a banana into small and nice pieces this slicer is comparable to nothing in the market. With its nice plastic body it can slice any sizes of bananas within few seconds. As using knife is risky, you can use this one with relax and quickly to get a safe experience of slicing. Its durable body makes it last for a long time to serve. Moreover, this slicer is also great for Cereal too. As some kids love to slice by their own, you can give it to your kids to slice. Fruit selection is a vital task as fruits are more likely to be rotten. Organic bananas are the best for making baby banana food. And green bananas are more suitable because you can ripen them on your own. But if you buy ripe bananas, go for the yellow ones without any dark spot. If you buy them in a plastic bag, take them out when you are storing them in your home. Plastic bag is harmful for Bananas. Keep them in the refrigerator at about 15 degree Celsius. You can store in the refrigerator by slicing them into small pieces. To store them out of refrigerator, you can store them in a dark and cool place. Apart from giving the whole banana to your baby or slicing them, there are some recipes which you can apply to feed your baby. Here are 5 of them. Ingredients: 1 ripe banana, water and milk. You can mix other liquids for better and softer consistency and texture. For Pureeing you can use food maker. Give a calm heat to 2 table spoon butter in frying pan. This recipe is great for the babies from 6 month to 10 months. Cut the meat out of the Avocado and mash with a fork. For the babies of 4-6 this one is perfect. Ingredients: 1 cup cooked brown rice, ½ cup banana puree, ½ cup plain milk yogurt, ½ tbs vanilla and Ginger or Cinnamon. Mix all the ingredients and warm them up in a pan. Frequently stir them. Put mixing ingredients in a blender for desirable texture. Blending doesn’t necessary for an older baby. Suitable for 8-10 month babies. Ingredients: 3 egg yolks, 2 ripe bananas, ½ cup milk and Nutmeg or Ginger or Cinnamon (Your choice). Blend all the ingredients in a blender till they get smooth and soft. Bake the mixture at 350F for 20 minutes as custard. Test it with a knife by entering into to center of it. If the knife comes out clean, means it’s ready. Great for 8-10 months baby. To make the recipes or banana baby foods, you must slice the banana. But slicing with knife is time consuming and a bit risky too. But if you use a banana slicer it would be more comfortable for you. 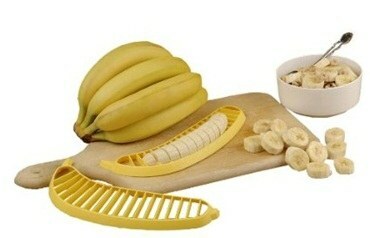 Here is one great Banana slicer. Banana is perfect for the babies who are about 6 months old and ready to eat and chew solid food items. At this age Banana is the best fruit for the baby. But there are certain precautionary to be followed. Give solid but easily chewable Banana to your baby. Avoid giving raw banana in this case. Major spotless bananas are the finest bananas. Don’t feed banana to your baby when your baby is suffering to cough or cold. And Summer is always better than Winter to feed Banana to your little one. Other seasons are also good except wet conditions. Banana, a great fruit for babies and for adults. Babies love to eat bananas. Follow the precautionary and it would be the best for you to prepare best banana baby food for your little baby.